I was so taken with the Weekly Photo Challenge theme this week that I couldn’t wait to look through my photos and try it. The theme ‘Threes’ is described as a three-picture story. It’s a way to help you think about storytelling with images, and I love the concept. 1.An establishing shot: a broad photo of your subject. 2.A relationship: two elements interacting with one another. 3.A detail: a close-up of one part of your subject. Don’t judge my husband for the jaunty, sequined beret. We made him wear it for the shot. 🙂 My mother is an avid scrapbooker, so she knew exactly what shot she wanted for her page. 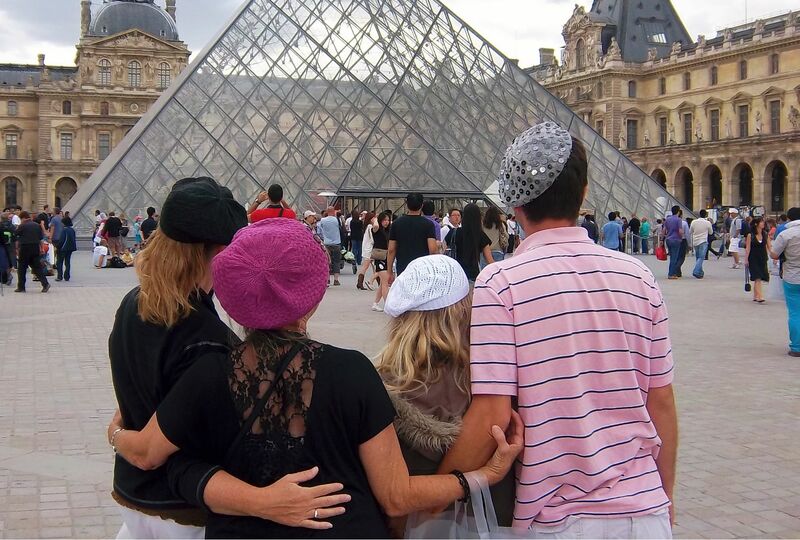 We needed a picture face-forward, but also needed someone to take a picture of us looking at the Louvre in our berets. After a couple of confused conversations with other tourists, we finally found a couple from Texas. The woman was a scrapbooker, too, so was more than happy to take the shot my mother described. You should see the finished scrapbook; it’s a work of art worthy of the Louvre. So, what do you think of this 3-picture story approach? It is something you would try? You can peruse more examples here. 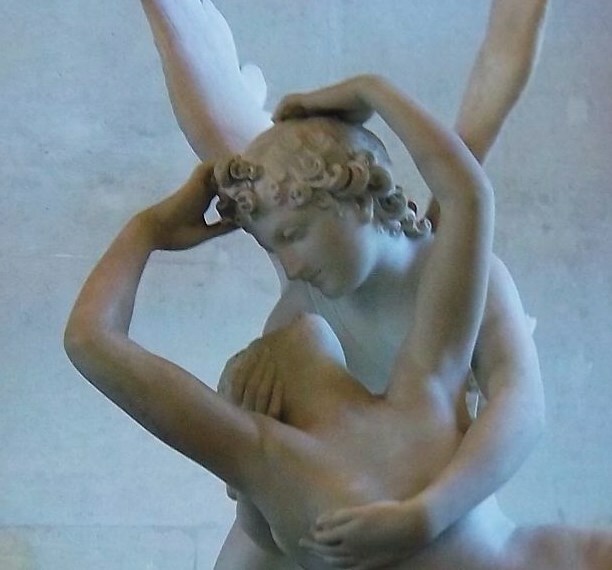 I really like the sculpture of the angel. It was hard to choose just one piece of art to share here. We were awed in every room and have a hundred pictures from our day at the Louvre. Absolutely magnificent. For me, too. 🙂 Thanks, Colline! I like the three picture/story idea. The best collections have a story to tell! But mostly I love the sequinned beret! Thanks. :). I liked the concept. I’ve seen some really good expressions of the theme. Madhu’s is one of those. Love how the sequined beret is just clinging halfheartedly to your husband’s head. Or am I just reading too much into things? 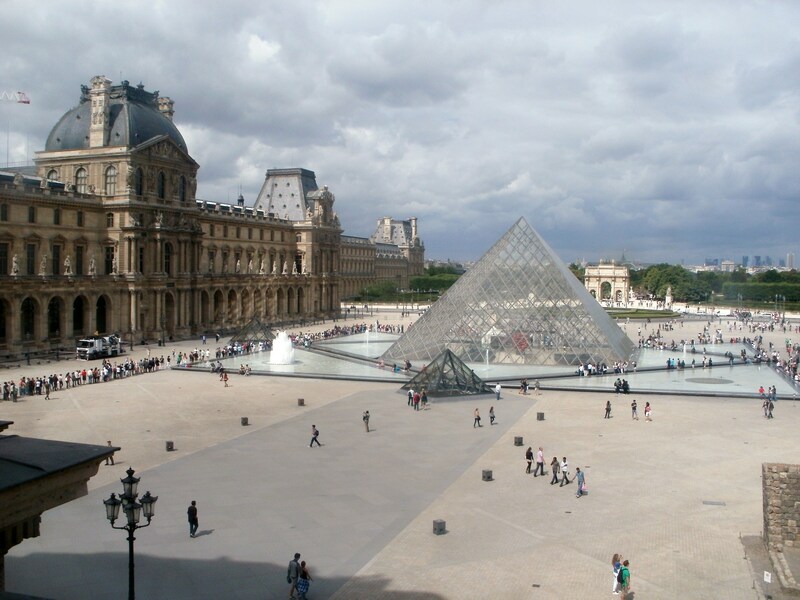 🙂 I’m visiting Paris myself very soon in the future with a friend so I’m definitely looking forward to going to the Louvre! My tip? See the lines to buy tickets in the first picture? That’s just to buy tickets. There’s another line to enter. Take the Metro, and when you come up underground, you can buy tickets there and skip the line. That is helpful beyond words. Thanks! Looks like lots of fun. I haven’t been to the Louvre for many, many years, but I still remember the overwhelming amount of amazing art. I also love the Rodin museum. I didn’t see the Rodin Museum, but did enjoy the Picasso museum. We’ll add Rodin to the trip next time. Haha, adorable! I love the berets.